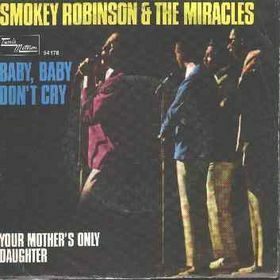 “Baby, Baby Don’t Cry” ended the Miracles streak of seven consecutive Top 10 R&B hits and was the group’s fourth and final hit of 1968. At four minutes, the song was one of Motown’s longest singles to date, but Smokey Robinson and Motown staff writers Al Clevelend and Terry Johnson made the most of every second. As a singer and arranger in 1950s doo wop group the Flamingos, Johnson wrote the arrangement for “I Only Have Eyes for You” and other genre classic. Recruited to Motown by Robinson in 1964, the pair turned in some of their finest work on this number. “Baby, Baby Don’t Cry” starts on the piano, but gives way to Miracle Marv Tarplin’s immortal guitar line. A full orchestra stealthily enters after the third stanza and explodes on the chorus. Again, Robinson and Johnson apply a deft touch to the score as the horns punch lightly and the string soar. For the spoken interlude, the song scales back to guitar, bass and drums, but never loses its warmth and fullness. On the last verse, the song shifts gears again, as the key changes and the bass and organ lean on the throttle. Rare among Motown hits, the Funk Brothers are completely absent on this recording. Strings and horns aside, the Miracles play all the instruments on this album, with Robinson’s wife Claudette’s distinct voice sitting atop the vocal arrangement. It’s hard to imagine anyone improving or adding anything new to these four minutes of perfection, and for once the rest of the industry agreed. “Baby, Baby Don’t Cry” is a rare Motown hit that hasn’t been covered. CONGRATULATIONS to THE MIRACLES on your Induction to the 2012 Class of THE ROCK AND ROLL HALL OF FAME .The Hall FINALLY welcomes MOTOWN’S FIRST GROUP. Kudos to PETE MOORE, BOBBY ROGERS, CLAUDETTE ROBINSON, RONNIE WHITE (RIP) and MARV TARPLIN (RIP) who finally get to join Lead Singer SMOKEY ROBINSON IN THE ROCK AND ROLL HALL OF FAME on April 14th 2012 !!! Great song but um er ahem you’ll have to back up the quote “Rare among Motown hits, the Funk Brothers are completely absent on this recording”. Who’s playing bass guitar…Smokey? Huh? I would be willing to bet my life that the musicians are The Funk Brothers. BTW – listen to the guitar intro through the first verse. Notice how the guitar changes it’s tone from part to part and overlap on the last note? That’s 3 different guitarists playing the part…not just Mr. Tarplin.